Items 176- out of displayed. On the 4h chart, price faced a correction in blue wave (4) and went to around fibo. level of 0.382 of the previous blue wave (3). Then price made a sharp impulsive action to the upside, so we assume that blue wave (4) is finished. That said, price may reach higher levels to around 141.77-142.00. 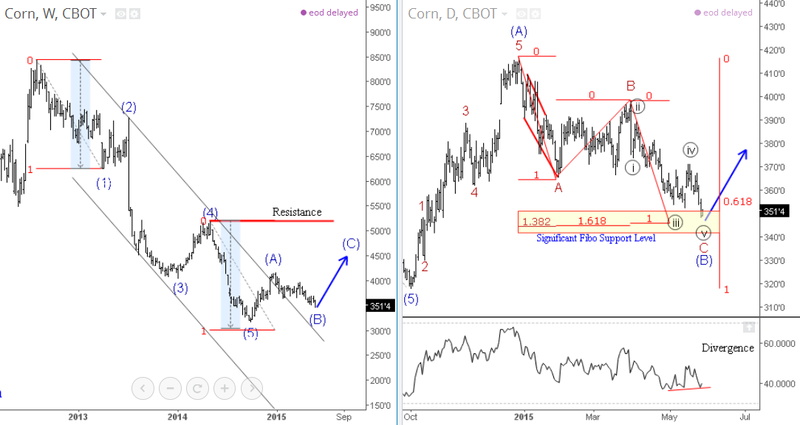 Corn has been bearish for the last three years as we see on the Weekly chart, but that is likely over as A-B-C corrective bounce can be unfolding. The reason for a bullish turn is a five wave recovery from the lows, that we labeled it as blue wave A as shown on a Daily chart. That said a current retracement from April highs can be a temporary three wave sat-back, labelled as wave B. Notice that wave B is now trading at some significant fibo support zone at 340-350. Technically speaking bounce from that area may occur soon, especially if we also consider Divergence on the RSI within current bearish swings. 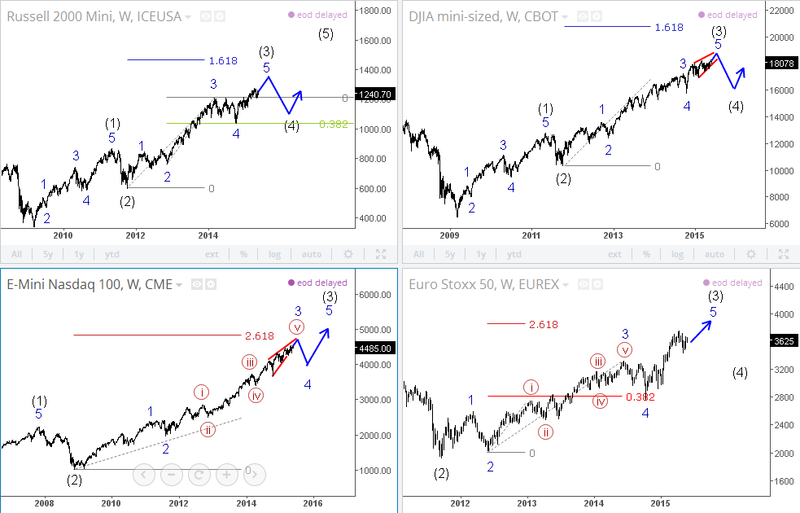 We see some major indices in final stages of an extended third wave, that could cause a temporary high on stocks, as we expect a deeper retracement in to a corrective wave four. On some of them we also see a wedge pattern in current late stage of an uptrend. It is called an ending diagonal, that usually causes a sharp reversal that may happen sometime this year. 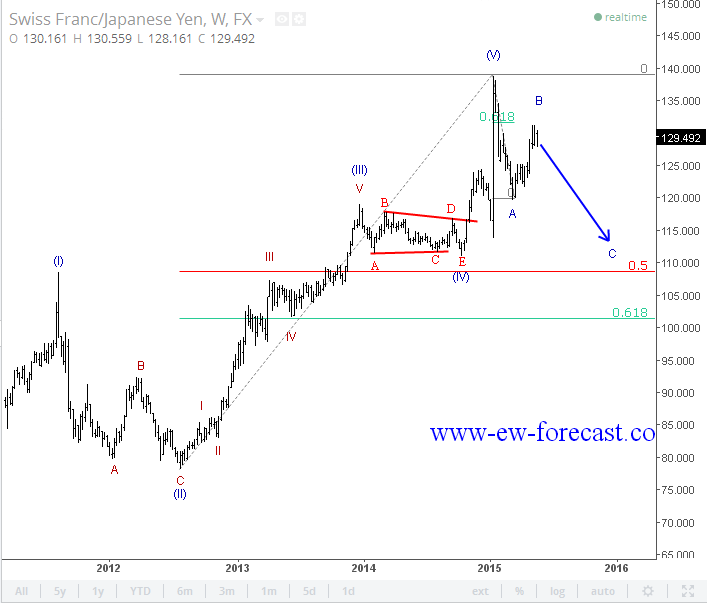 CHFJPY has been bullish for the last two years as we see on the Weekly chart, but that is likely already over as A-B-C correction is already unfolding. The first wave A has already made 5 waves down, which confirms a new bearish cycle, that said be aware of more weakness after current wave B that is approaching resistance level. 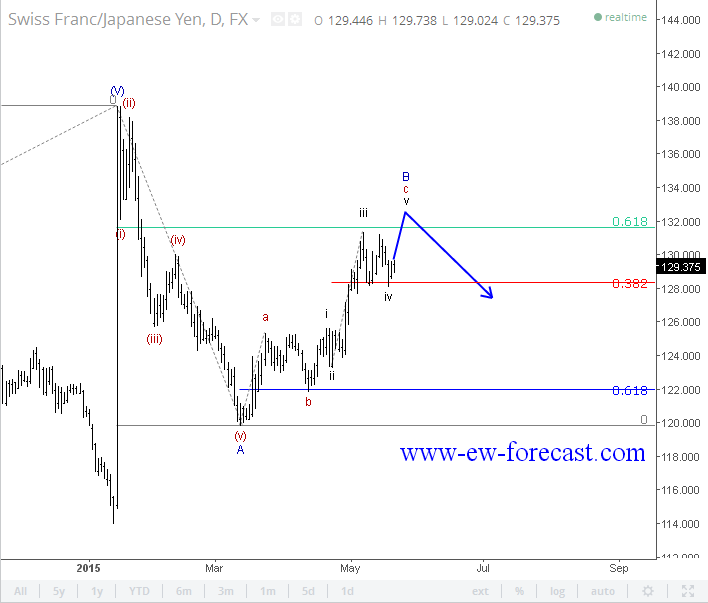 EURJPY is bullish for the last two months but this could come to an end in coming days or weeks, because we can count five waves up on the 4h chart. Besides that we also see a decreasing bullish momentum on the RSI, while the price can be forming a wedge pattern in fifth wave. 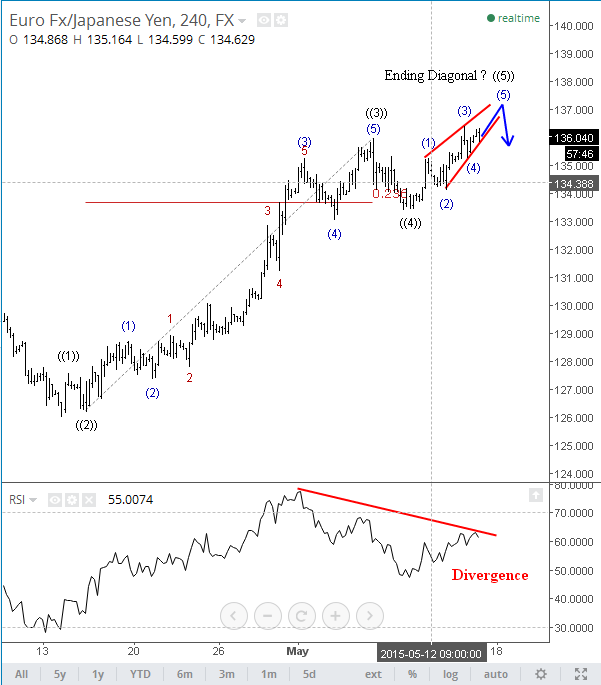 This refers as an ending diagonal in Elliot Wave Theory which can cause bearish turning point, possibly from around 137. 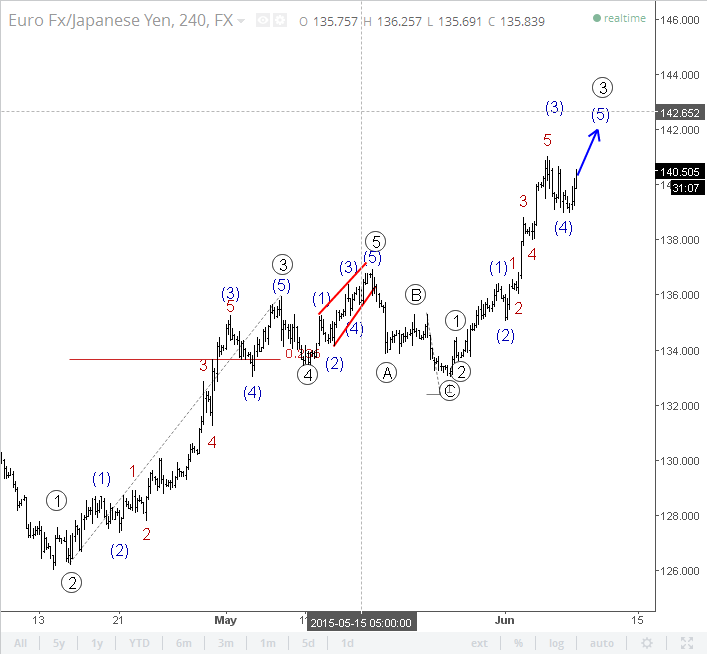 EURUSD is at new high as expected, now trading in fifth wave of wave (C) that is approaching important 1.1400 level. Make sure to check our video below and find out why this price matters from a technical as well as time perspective if we consider NFP coming out tomorrow. 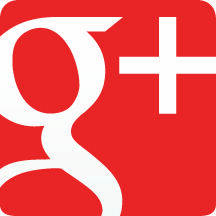 Register for our services now, and get FIRST 2 MONTHS FOR THE PRICE OF 1!! 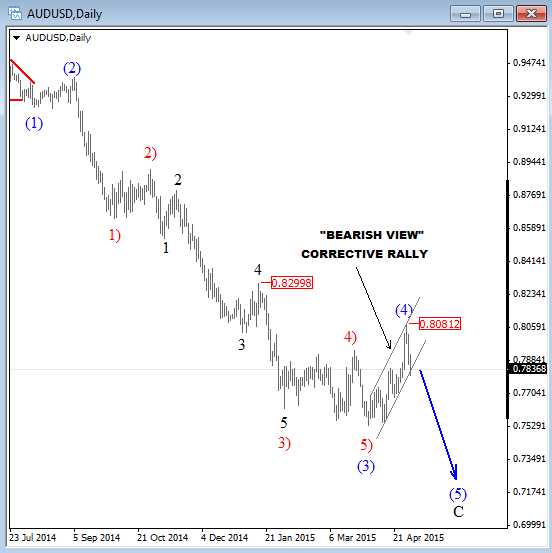 AUDUSD has turned up in the past few months, but most likely only temporary as rally from the low is having an overlapping structure. We know that this is a characteristics of a contra-trend price action, so trend remains bearish for now within impulse that is in play since mid-2014. Ideally, market will continue lower in weeks ahead, down into wave (5), especially once the trendline of current upward channel will be taken out. 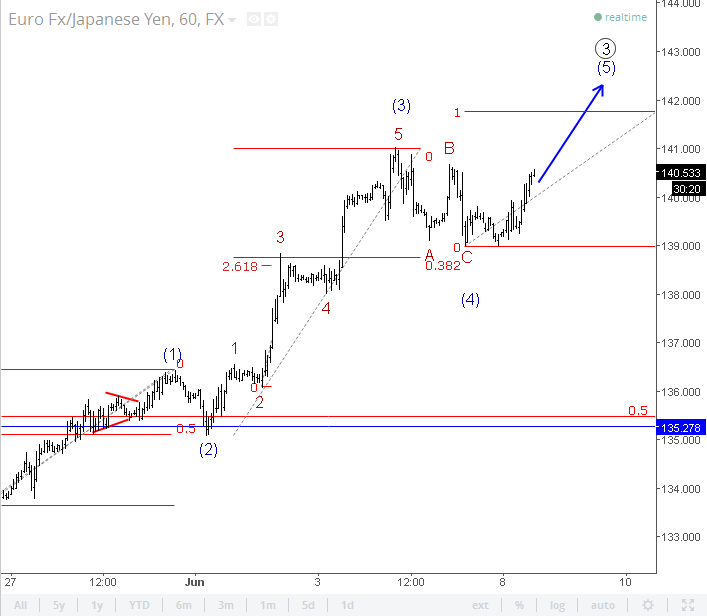 We could be considering different view and look on other side only if price would break above 0.8300.